Things to do, best restaurants, attraction spots, shopping hubs and accommodation options in Melbourne is explained in details. Think about a city isolated from the chaos in rest of the world but has more to attract than the world has. Melbourne is the place where peace reigns. Your eyes will need to get familiar with the green and blue in Melbourne. Wherever you look, you see the green of botanical gardens and the blue of the ocean or the River Yarra. Weather loves to surprise you in Melbourne. When you enjoy the sunshine by the river, sudden raindrops may moisturize your face. This city is where you can experience four seasons in one. Even so, it knows how to seduce you with its magic so that you also fall in love with this untimely weather. The world’s most livable city in terms of culture, weather, health and crime rate, Melbourne boasts also being the city of order. People of Melbourne have the auto-control and they seem they do not need any other kind of authority. Even in such a cosmopolitan country, people live in harmony and in a great tolerance. In Australia, if you are in the mood of eating, shopping or having a night out Melbourne is the place for you. Being the cultural center of Australia, Melbourne host numerous events like congresses, tradeshows, fairs, art activities and many more. Horse races are also popular in Melbourne. Being the capital city of the state of Victoria, Melbourne is located on the southern shore of Australia. Skybus operates 24 hours a day including public holidays. You can buy your ticket at the bus stop or you can book it online via Skybus official website. Melbourne taxis are safe and comfortable. If you travel on public holidays or if you land at night additional charges may apply. Have a nostalgic tour in Melbourne by taking a carriage ride. You can catch a ride from Swanston Street. Horse racing means everything for the people of Melbourne. Spring Racing Carnival is the most popular among all, however there are plenty of other races throughout a year. Be sure you experience one of these high profile events when in Melbourne. If you can expand your trip, going to the beautiful beaches in Melbourne will be an unforgettable experience. In the city center, local people do not generally go to the beaches. Try one of these beaches to taste the salt of the ocean, heat of the sand and the bronzing rays of the Sun. Since 1846, covering 36 hectares of area and housing over 50000 plants from all around the world. Royal Botanical Gardens has remained as the most popular tourist attraction in Melbourne. A nice option to give yourself a break. Built in 1931, the neo Gothic St Paul’s Cathedral is a must see landmark in Melbourne. Cultural icon of Melbourne, Flinders Station is worth seeing for it is the first railway station in Australia. Be ready to be in the highest skyscraper in the south hemisphere. Reaching nearly to 300 meters, Eureka Tower offers a 360 degree view from the windows floor to ceiling. The express elevator will take you 297 meters high in less than 40 seconds. Nation Gallery of Victoria boasts being the oldest public art gallery in Australia. From ancient to contemporary, National Gallery of Victoria offers the international art. One tip is that you will not regret seeing Great Hall’s stained glass ceiling. Melbourne Museum is the place to explore the Victorian life. Housing 8 permanent galleries, Melbourne Museum offers anything representing Victorian culture, art and history. Chaple Street is where you can get rid of the tiring atmosphere of the congress. You can lose the track of time while shop hopping along this street. For more than a century, Melbourne’s one of the most important market place Queen Victoria has been the place where you can find anything from the local vegetables and imported gourmet foods. Clothing, souvenirs and cosmetics are also available. If you like to relax yourself and enjoy your time in Melbourne, you can try gaming in Casino Crown. It is wise to bear in mind that staying in control will delight you more. Alumbra Lounge is one of the classiest nightclubs in Melbourne. If you are looking for the good music and gorgeous drinks you have found the right address. Offering you the Italian spirit, Lygon Street is full of restaurants and cafés. If you like to go Italian, visiting this street will be wise of you. Located in St Kilda, Stokehouse offers you the great wine and excellent food with a beach scenery. Dining there would be dreamy. However being there in the afternoon will be indescribable if you can find a time to escape. Inspired by the world cuisines, Lentil as Anything offers a vegetarian menu. They use only organic ingredients from local suppliers and they do not charge anything for what you eat. It is their philosophy that you do not pay but contribute. You can pay as much as you afford. Being a non-profit organization, Lentil as Anything steps forward to change the world! In Australia, drivers goes on the left side and the vehicles have their steering wheel on the right. It is wise to be careful in traffic. Sun in Australia is strong and you can get sunburn easily if you do not use sun lotion or you do not cover your delicate areas even on cloudy days. You see red and yellow flags in the beaches. They mark the safest zone to swim and you had better not to swim out of these points. 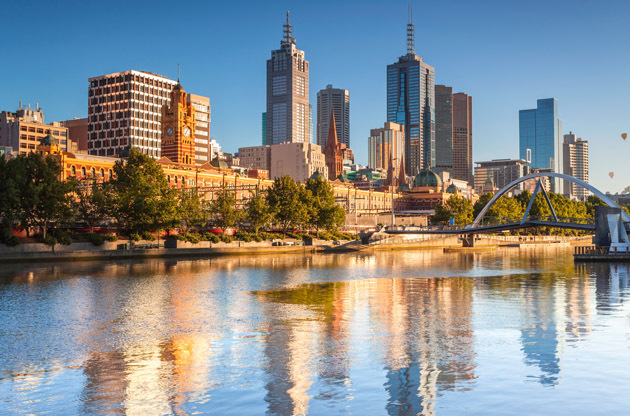 Melbourne, the most liveable city of the world has extensive transport network and superior conferencing facilities in the world class venues which makes the city the center of charm in terms of international meetings. Boasting being Australia’s intellectual capital, Melbourne is home to many national and international organizations. Congresses, conferences, fairs, tradeshows, exhibitions and symposiums in Melbourne makes millions of people come to the city ever year.